« The Ever-Shrinking PC: Could Windows Mobile be “Netbook 2.0”? Mobile World Congress in Barcelona proved to be an exciting coming out party for Microsoft’s newest additions to its mobile offerings: Windows Mobile 6.5, My Phone, and Windows Marketplace for Mobile. Early leaks on blogs and in the Wall Street Journal in advance of the conference indicated what Steve Ballmer would announce in his keynote on Tuesday, but this was the first time the general public had a full preview of what Microsoft is launching. 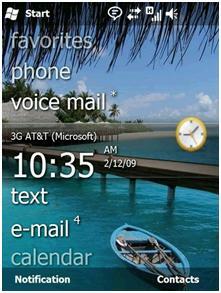 Windows Mobile 6.5: The two major innovations on the platform are a redesigned user interface and a full web browser. The UI redesign uses the popular widget concept to display favorite tasks, settings, and applications on a single screen. 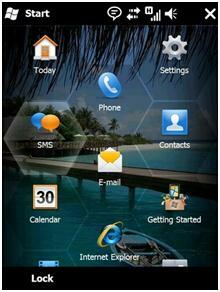 The “honeycomb” layout is fully customizable by the end user. On the home screen, the concept is to display the most relevant information (missed calls, voicemail, text messages) with easy left to right “flip” access. The UI layout itself is attractive, easy-to-use, and a much needed face-lift to WM 6.1. Unfortunately, the redesign only applies to touch screen devices. While Internet Explorer 6 has been available on select Windows Mobile devices since last summer through the “6 on 6.1” release to OEMs, this is a big step for the OS and a much-needed response to iPhone’s Safari. Is this a “me too” response? Yes and no. Microsoft is late to the game on the full browser experience, but IE 6 beats Safari in some key areas, namely support for a broader range of websites and full rendering of Flash-based animation. Now you can watch a YouTube video without installing an application or check out picture animation of a hotel room on your favorite travel website. My Phone: Microsoft is making good on its promise to provide more mobile services to the consumer market. Windows Live Search is still the best mobile search application on the market with voice activated search and location-relevant information, including gas prices, movie times, and category search. My Phone is the next step in the suite of products, featuring automatic syncing and backup of contacts, appointments, text messages, pictures, videos, and other information. The service allows you to restore your information easily if you lose or upgrade your phone. My Phone has a website companion that features cool add-ons, such as the ability to archive and store your text messages online and remove them from your device. Best of all, My Phone is completely free compared to the $99/year MobileMe service on the iPhone. It’ll be interesting to see what Apple’s response to the service will be, but this is all great news for consumers. The one disappointment is that the service does not yet integrate with Windows Live and Live Mesh (both outstanding products), but this is on the roadmap for future releases. Windows Marketplace for Mobile: Finally! There’s an easy way for people to find and download applications for their WM phones. Rumors and speculation have been rife since last fall after a job posting was inadvertently leaked on the web for recruiting a Product Manager for the mysterious “SkyMarket”. This was a long time coming, but it’s nevertheless exciting to see Microsoft make investments in this space. Windows Mobile boasts over 20,000 applications today, and Windows Marketplace will almost certainly attract more developers to the platform. The one drawback aside from the name (SkyMarket just sounds cooler) is that Marketplace will only support WM 6.5 for the time-being. This means we won’t see a full launch until later this year when commercial devices hit the retail market en masse. One speculated announcement notably absent was Microsoft’s entry into the device business. Net-net, this was a big week for Microsoft’s mobile division. While some of the announcements are backfilling what’s already available on competitive devices, Microsoft has leaped ahead in certain areas. More importantly, WM 6.5, My Phone, and Marketplace are important signals that Microsoft is serious about its mobile strategy, particularly in the consumer space. The full press release is available online.